This lever has become the industry standard across the lever harp world. It uses a neat mechanism to move a pin horizontally against the string which is pushed into a grooved barrel behind. This is a smooth action lever with a very positive fixing of the string giving excellent sound quality. It is simple to regulate and well supported globally. 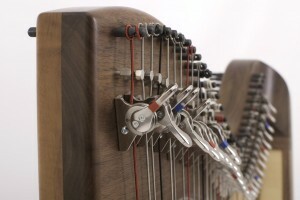 We fit these levers on all our harps.